With the start of the New Year, we tend to reflect on the previous year as well as contemplate the year ahead of us. This is a great time to set your intentions and goals for the new year and ACT upon them! Going into the New Year, I did not have a specific goal in mind. However, on New Year’s Day morning, I saw a post from the North Carolina State Parks Instagram account (@ncstateparks) promoting their NC 100 Mile Challenge. I spur-of-the-moment decided that the 100-mile challenge would be a fun and health-forward SMART goal for 2019! 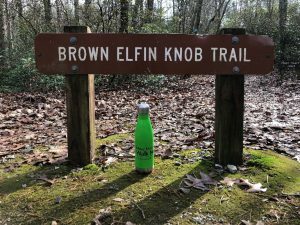 For my #FirstDayHikes 2019, I hiked the Occoneechee Mountain State Natural Area in Hillsborough, NC. 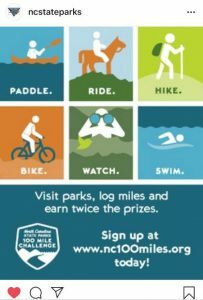 The NC 100-Mile Challenge is an initiative launched by NC State Parks to encourage everyone to get outside and explore our trails and waterways. You do not have to be a resident of NC to sign up for the challenge, but the miles must be completed in NC. Apart from that, there are no restrictions on where you complete the 100 miles– whether you walk around your neighborhood, hike at a state park, run at a city park or bike at a national park, it all counts towards the 100-Mile Challenge. There are incentives for participating in the challenge, like exclusive sticker packs. The website has not been updated yet for 2019, however, I would imagine the prizes are similar to what was offered in 2018. To redeem the prizes you must have the corresponding badge to the prize you are requesting. NOTE: the prizes are not cumulative over the years. Check out the FAQs if you have more questions. I ask you to join me and make NC 100 mile challenge one of your SMART goals for 2019! Is Harissa the New Sriracha?